A promising sign: Surveying along Riverside Drive for wider shoulders. On the mid-valley bike-trail front, there are developments and one of them — a bill introduced by Rep. Andy Olson of Albany — could complicate things a bit. In Salem, the House committee dealing with land use held a hearing April 7 on Olson’s HB 3367. The bill says it would “authorize” recreational trails as conditional uses on land zoned exclusively for farming. Actually it would require sponsors of such projects to try to obtain a permit from local jurisdictions. The bill was prompted by uncertainty over whether present law already requires this. Some say it doesn’t but Benton County decided to seek a permit anyway for its Albany-Corvallis Bike Trail, and the county planning commission shot the application down. The Oregon Farm Bureau supports the bill, and the Oregon Recreation and Park Association opposes it. In its testimony, the Farm Bureau said: “HB 3667 clarifies that development of new recreational trails, even within existing roads or rights of way, are required to go through the conditional use process.” If that’s true and the bill passes, Benton County would have to get a permit even if it wanted to route the Albany-Corvallis trail within the Highway 20 right of way. And Linn County presumably would have to get a permit for its planned widening of Riverside Drive to accommodate better bike lanes from Albany to Highway 34. One problem is what trails are called. To me they’re not merely “recreational” but transportation routes, and as such they should be exempt from additional permitting, even on farm land, under existing law. Olson says he hopes to get the committee to advance the bill. — Benton County has sent a letter to about 300 landowners in the vicinity of Highway 20 inviting them to participate in choosing a new route for the proposed Albany-Corvallis Bike Trail. “The county is preparing to hire an outside planning consultant to facilitate a detailed process to review all potential alignments for a path near the Highway 20 corridor,” Public Works Director Josh Wheeler wrote in the April 6 letter. The county plans “to begin outreach at the end of the fall harvest season” to give property owners ample opportunity to become involved. 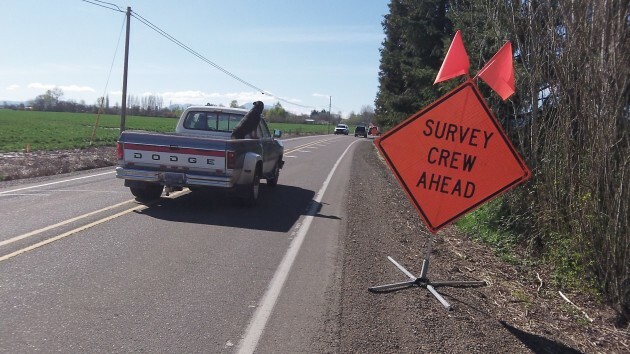 — ODOT announced Friday that work will begin about April 16 on the South Bypass Project on Highway 34 east of Corvallis. The main job is to create dual right-turn lanes from the northbound bypass on to eastbound 34. Among the other elements will be to extend the multi-use bikeway on the north side of 34 eastward to Riverside Drive and westward to an existing path under the Willamette River bridges. The bikeway will also get a new bridge across Owl Creek just west of Colorado Drive. Delta Construction of Eugene has the $3.38 million low-bid contract and expects to finish by this fall. — The city of Albany announced Friday that construction will start Monday (April 13) on a multi-use path that will connect Albany Station to Swanson Park. The path will run along the Union Pacific tracks under the Pacific Boulevard viaduct. HP Civil Inc. of Stayton has the $383,700 contract funded by a federal grant. The path, the last phase of the station remodel started in 2005, was to be built last year but somebody forgot to get the railroad’s OK. That, presumably, has now been done. — And Linn County recently did more surveying along the three-mile segment of Riverside Drive from Oakville Road to Meadow Road where the commissioners want to improve the bike-riding shoulders, a job likely to be done in 2016. Eventually the county hopes to extend the widening all the way Highwqay 34 to connect with the new bikeway there. Get on the oil exploration band wagon! Have some “promoter” conjure up some stats that there “may be” oil along the proposed bike route. Salt it with some waste oil just for effect. Standard Oil might just beat a path for us exploring it then abandon it as a dry hole. Two projects for the public to use property they already own are getting legislative logjams in the last year. Whether the bike/pedestrian route or access to public parkland, some folks want to stop it no matter what. When your elected legislator sides with shutting down access, you might as well give it up.